Hey everyone! It’s not a secret that I have a foodie, and these days in Spain have been like paradise for my appetite. Whenever people ask me about food in Spain, I never know how to answer. The truth is that it really depends on the area of the country and your own culture, but generally we follow the mediterranean diet. That’s a very broad concept, but the main ingredients are olive oil, vegetables and healthy fats. I have prepared a compilation of some of my favorite dishes that my family spoiled me with prepared these days. This is how a typical dinner table looks at home. Some call it tapas, we don’t call it anything, it’s dinner. The food is there, you have your plate and you just get whatever you want. This time we had “Galician style octopus,” which is delicious! And the rest are different types of sausages, which is very common where I live. If you look at the bread, it has some tomato and olive oil spread. That’s “pa amb tomàquet” or bread with tomato, and it’s the only way catalans eat bread! The next picture is another favorite dish of mine. It looks like pasta, but it’s actually sea food. 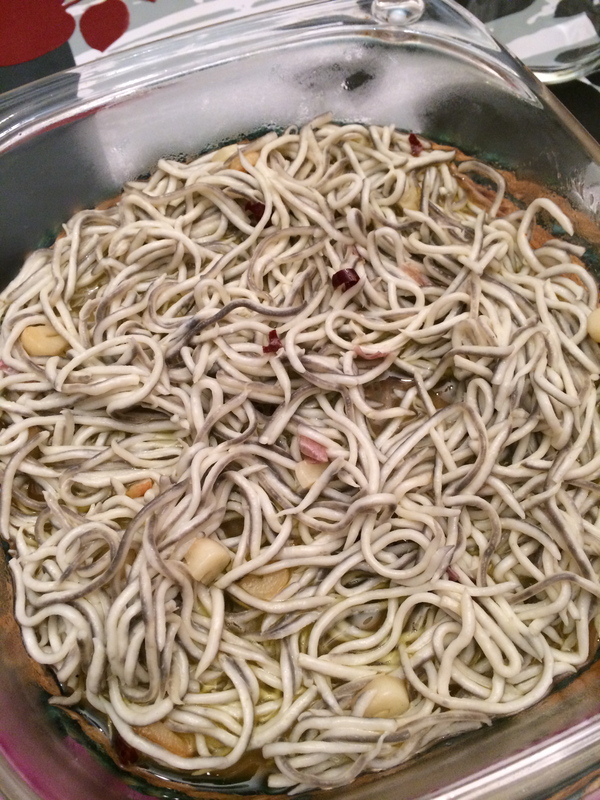 I think the correct expression in English is cooked elvers. Whatever it is, don’t judge by the looks! It has garlic, olive oil and chili pepper. 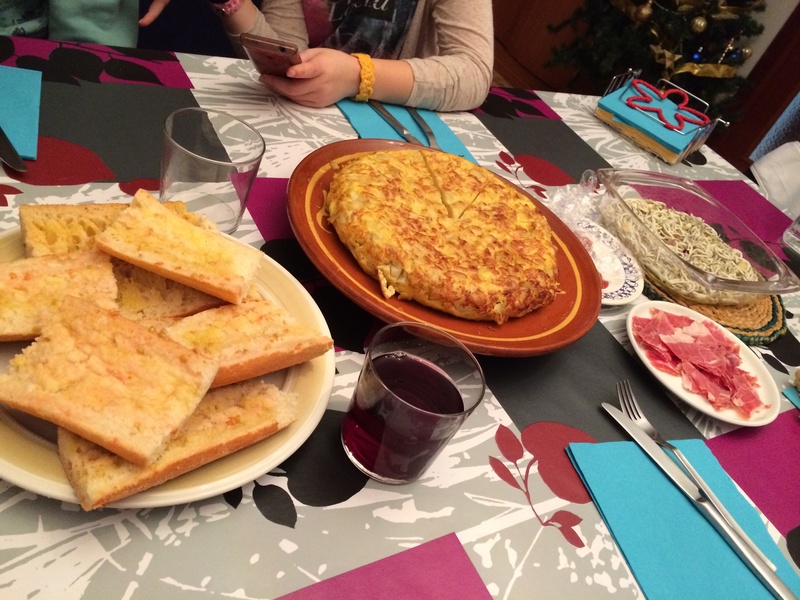 One of the signature dishes in Spain is the “tortilla de patatas” or potato omelette. Not to confuse with Italian frittata! 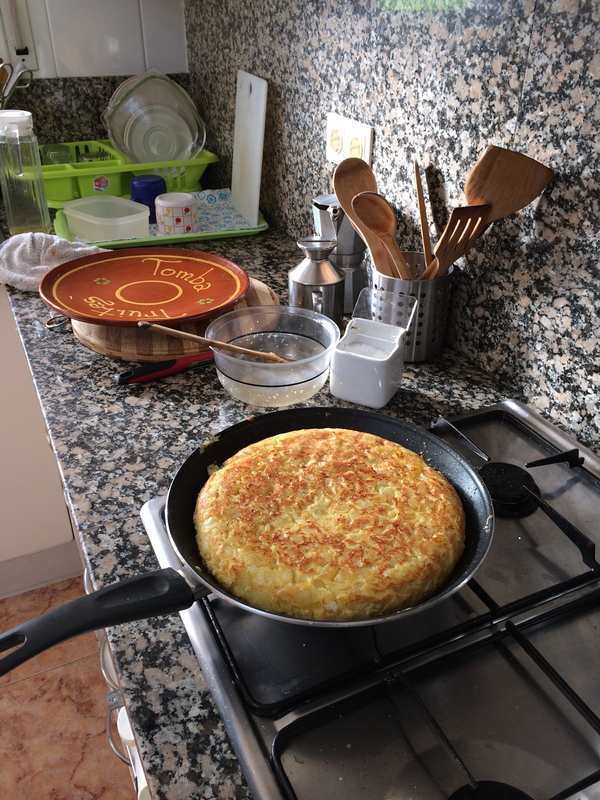 I consider “tortilla de patatas” to be an art, and combined with “pa amb tomàquet” (bread with tomato) tastes like heaven. Here’s the dinner table my friends and I prepared for our own Christmas night, which we celebrated the day we could all meet. 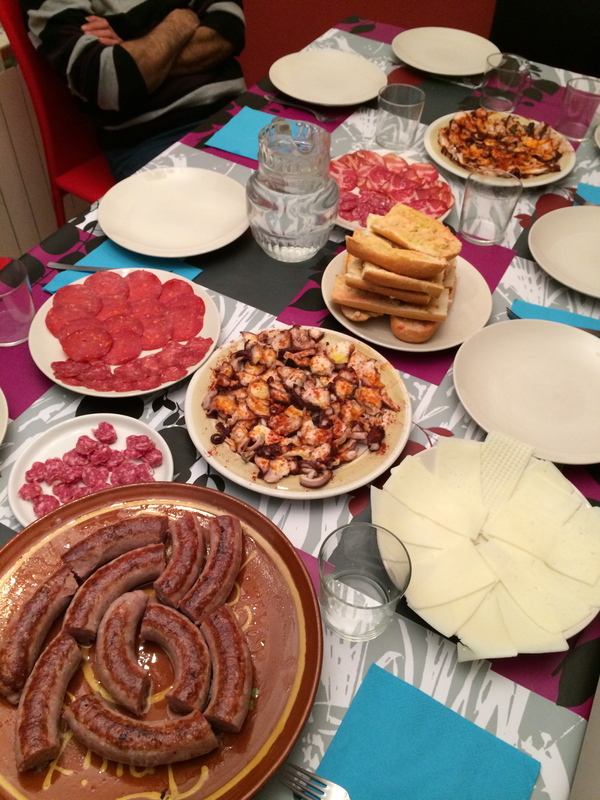 As you can see, we also used the “tapas” concept, and filled the table with traditional Spanish stuff… More than half of us don’t live in Barcelona anymore, that’s why having this food is absolutely imperative for our group! 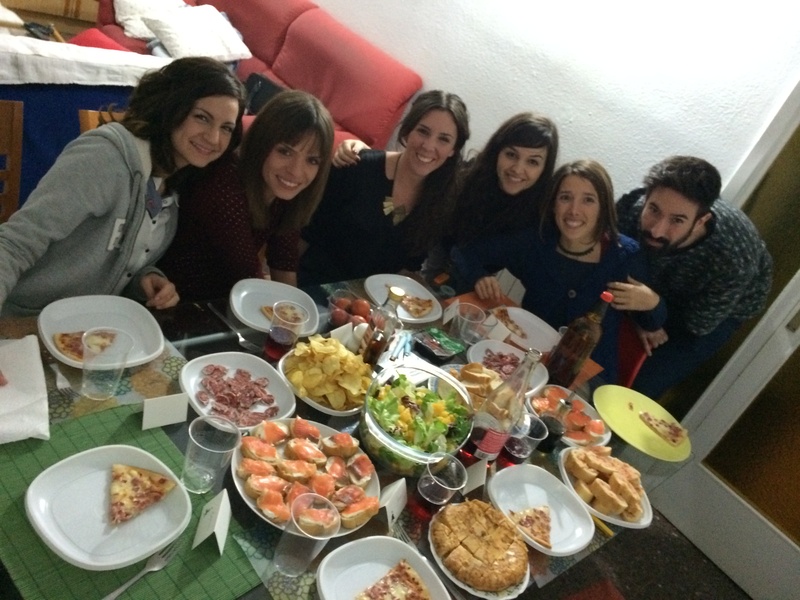 The pizza was just there in case we were still hungry… but it doesn’t apply as Spanish! 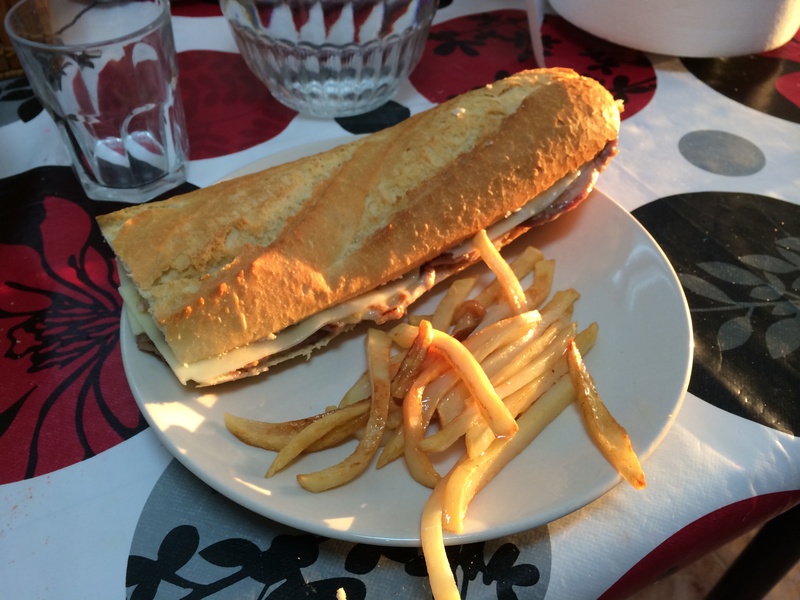 I also wanted to show you how a sandwich is supposed to look in Catalonia. Forget the sliced bread… a real Catalan sandwich is made with a baguette and it has tomato spread on it. Delicious! Next is a dish whose name I honestly don’t know. What I do know is how awesome it tastes! 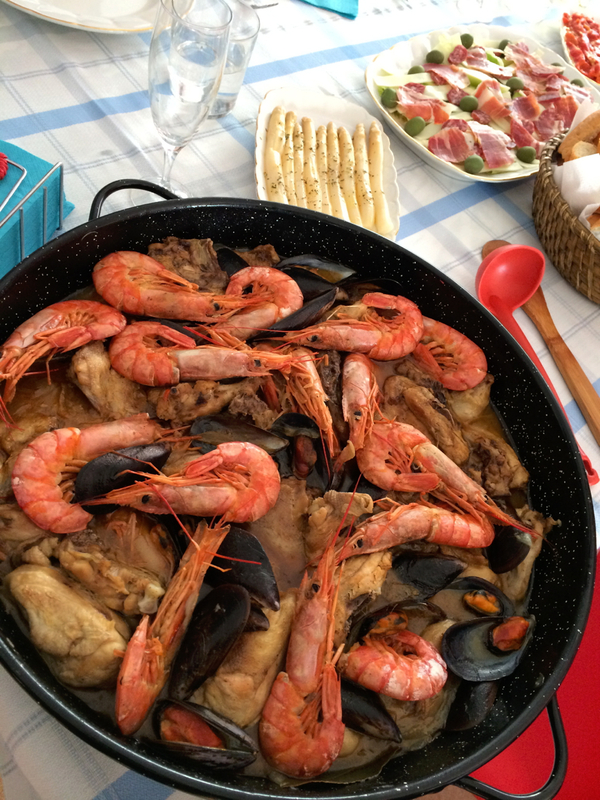 It’s a combination of sea food and chicken, all cooked slowly on a paella pan. It has chicken, shrimps and muscles. We also have great desserts. This is my mother’s flan. It’s something similar to egg custard or crème caramel. 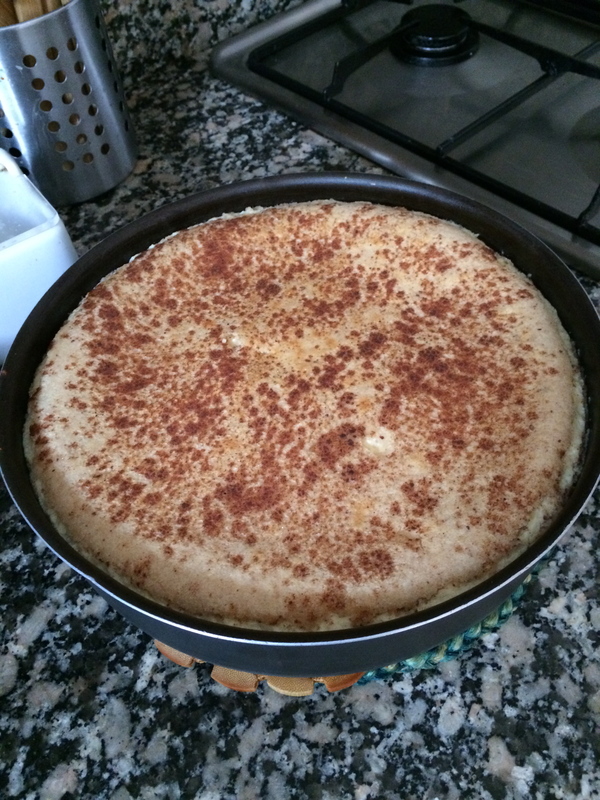 It’s made out of eggs, caramel, milk, condensed milk, cinnamon and almonds. One day I will be brave enough to make it myself, but for now I just enjoy it whenever my mother makes it! Finally, the big star. Whenever I’m asked for a traditional Spanish dish, the first thing that comes to my mind is paella. There are many versions of this dish, but judging from the picture you can get the basics. 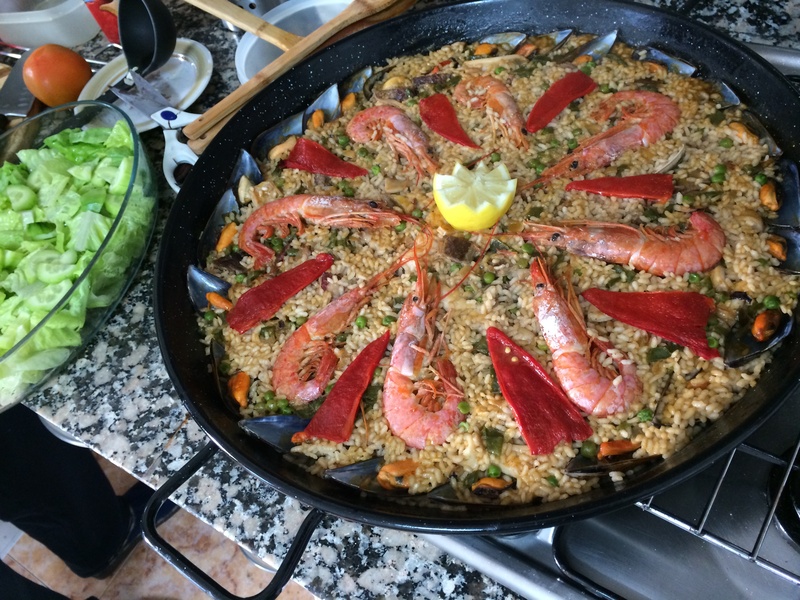 My father is a paella artist, and I’m trying to learn. This one is mixed one, because it has meat as well as seafood. I can’t stress enough how much I enjoy this dish! This was only a small selection, because the list of dishes I like would go on and on forever. I hope you now have a better idea of how we eat at home! Thanks for reading and see you soon! Thanks! I just checked out your blog and all those dishes made me really hungry!!! I grew up in Barcelona, Spain. I moved to New York City to get my BBA in International Business at Berkeley College after studying Advertising and Public Relations in my country and in Tallinn, Estonia. I love traveling; it's my biggest passion. I like learning about new cultures and traditions. I consider myself to be a very positive and active person.